Niki de Saint Phalle was born in 1930 in France to a wealthy family who then lost their fortune in the stock market crash. She relocated to New York City, where she went to school and began an eclectic, artistic career. She was a fashion model, a painter, an actress, and a world traveler until 1953, when she suffered a nervous breakdown. She recovered largely because of her focus on painting, where she refined her unique, self-taught style. After 1955, she discovers the work of Antonio Gaudí and is inspired to create her own sculpture garden using found objects and a variety of other source materials. During the 1960s, she became known around the world for her Shooting paintings – bullets penetrated paint containers which spilled their contents over the painting. De Sait Phalle traveled around the world performing shooting session, while also becoming friends with artists Robert Rauschenberg, Jasper Johns, Larry Rivers and his wife Clarice Rivers, with whom she collaborated with. She is also known for her sculptures known as “Nanas” which are archetypal female figures, the proverbial everywoman. These freely posed forms, made of papier-mâché, yarn, and cloth were exhibited at the Alexander Iolas Gallery in Paris, and for this show, Iolas published her first artist books that includes her handwritten words in combination with her drawings. Nikki de Saint Phalle died in 2002 in her home in California. Her life was filled with enormous beauty that continues to spread and inspire lots and lots of art and artists everywhere. She is a one of a kind and we are lucky to have one of her books that is signed by her from 1987, back when people were just starting to learn about the AIDS epidemic. Nikki created this wonderful publication with Dr. Silvio Barandun to help with spreading the education about the disease. It is a 52-page, full-color hardcover book which is displayed proudly in our library. Posted in: Featured Artists. 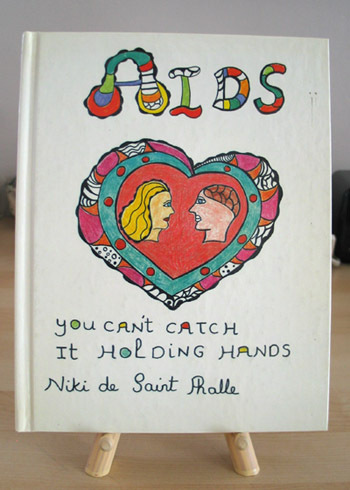 Tags: AIDS, art, art collecting, books, Niki de Saint Phalle. 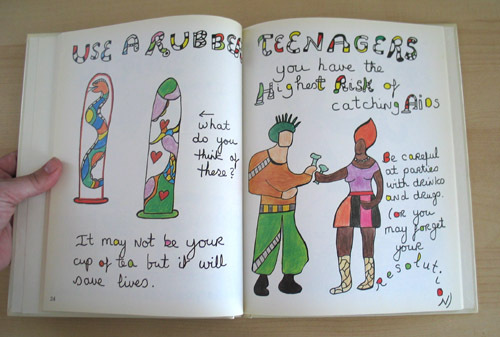 we LOVE Nikki de Saint Phalle! I saw a few of her works in San Diego a number of years ago and have been an ardent admirer ever since. Her bright colors and “fatty patatty” sensibility, her infectious happy lunacy, always make me smile. And, thanks for restarting Picklebird! Wish everyone could have a copy of this book. 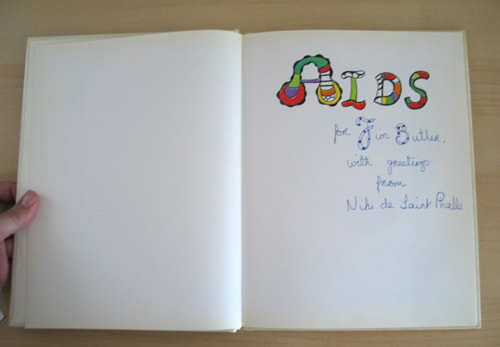 I have a book AIDS by Niki de saint Phalle, it was in Helen Frankenthaler library with an embosed seal of Helen’s. I am interested to know if anyone is interested in this book, it is unsigned. I am interested in this book. I ownder if you could email me more information.